- Bend it Like Beckham. It has been so long since I've seen this one. I cannot remember at all what it's about. Now that I think about it, I haven't a clue why I dropped $8.99 for the pleasure of taking it home. - The Muppets, (the funny recent one that I enjoy) Tangled, and Cars. I only bought Cars because it is most likely "in the vault" and all that nonsense. I dislike everything about the movie Cars. At $3.99 it seemed like an investment piece, though. I did find Princess & The Frog, but my kids are terrified of the witch doctor guy in that flick. So I didn't even buy it for the completely imagined investment value. 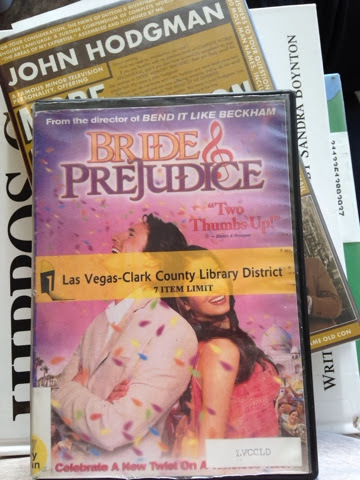 I DID however, check out the movie section of our local library and guess what I FOUND?! So I feel a bit vindicated. I don't feel the pressing urgent need to sift through mountains of videos at the Blockbuster. Whenever I get a little wistful for some Bollywood dance numbers, I can just check it out at the library. The Husband likes to make fun of me joking "You'll never have to worry about someone else checking it out. It will ALWAYS be there for you, the one person wanting to watch that." HAR HAR, Husband. Excellent! Bollywood is good times. I just thought of a movie that I would consider my needle in the haystack movie. Life with Mikey starring Michael J. Fox. Mmm...circa 1993. Seen it? I wanted to be the leading girl. So. Bad.